There are many different types of ad targeting for ad campaigns. But on the front end, you often don’t get to see how the technology is actually working. It’s important to understand the nuances of each primary way of targeting, though, so you can think through a campaign on a tactical level. We’ve reviewed the types of ad targeting here, here, and here. But we wanted to put together some of the five most popular methods of targeting on one page. Behavioral targeting is the practice of segmenting customers based on web browsing behavior, including things like pages visited, searches performed, links clicked, and products purchased. If you add mobile and physical store data into the mix, that can also include things like location, and in-store purchases. 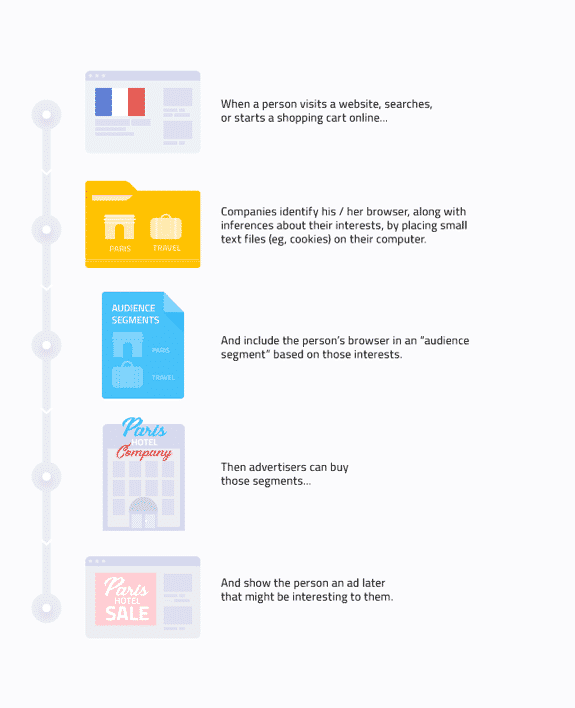 Visitors with similar behaviors are then grouped into defined audience segments, allowing advertisers to target them with specific, relevant ads and content based on their browsing and purchase history. An oft cited example of behavioral targeting is retargeting ads. Contextual targeting involves displaying ads based on a website’s content. Think: placing an ad for dishware on a recipe site, or an ad for running shoes on a running forum. It’s kind of like the digital version of placing a print ad in a niche magazine. It works based on the assumption that someone reading a page about running is likely to also be interested in your ad for sneakers. Search retargeting is when you serve display ads to users as they browse the web based on their keyword search behavior. Campaigns are set up with keywords that you choose and that are relevant to your business or products. For example, if you are a furniture retailer, you might want to serve display ads to users who have searched for “leather couch”, or “leather sectional”. This kind of advertising is successful because it uses intent to connect with shoppers. The shopper may or may not know about you, but they are showing interest in a product or solution that you offer. Think of this as an upper funnel, prospecting strategy. Site retargeting, also known as just “retargeting”, involves showing display ads to users who visited your site and then left without completing a purchase to browse elsewhere. It differs from search retargeting in two important ways: it is not keyword based, and it is targeting people who are already familiar with your brand, or who at least have visited your site once and showed interest in your offerings. Because of this brand recognition, the ROI of site retargeting is often extremely high. Think of this as a lower funnel, conversion focused strategy. Predictive targeting uses all of the web browsing data from behavioral targeting, layers in 3rd party data (if available), and applies powerful AI and machine learning to analyze the data and predict future buying patterns based on past behaviors. The AI that powers predictive targeting can make connections between behaviors, identify similar and related products for upselling and cross-selling, and zero in on the shoppers most likely to convert at any given time—all in an instant. And the more data it analyzes, the more it learns and the better its models become. Ready for more? Visit our Retargeting and Digital Marketing for Small Business hubs for tons of info, insights and tips.